RADEAGLET is designed for high performance nuclide identification in a small, lightweight housing. 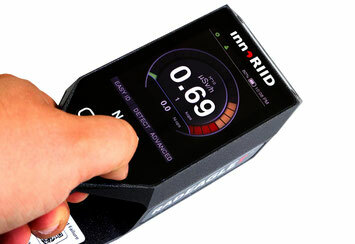 It is the lightest radio-isotope identification device (RIID) on the market. 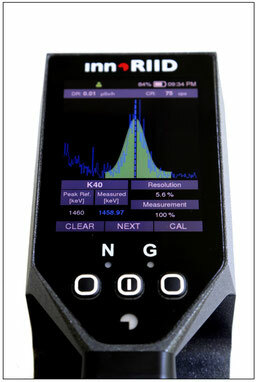 It measures the dose rate, locates the source and identifies it. Reliable, robust and quick. Please find further key features by scrolling down on this page. RADEAGLET´s detector is sensitive and small. It is read out with a smart signal processing technique that allows for tremendous throughput and optimal resolution. It consists of a sodium iodide NaI(Tl) crystal which is sensitive to radiation. But thats not all. RADEAGLE can be equipped with other detector materials as well. We also offer a lanthanum bromide LaBr3(Ce) variant, which provides even better resolution. RADEAGLET features 8 hours nonstop operation, adding up to 16 hours of nonstop operation when using the extension package. Operation time is of great importance in the field. Therefore, all components of the RADEAGLET were designed for low energy consumption and efficient processing, including Automatic display dimming and energy-saving features in its computer system. Like in modern smartphones, the RADEAGLET display is bonded with the glass cover. The three-button keyboard smoothly integrates into the unit. Precision and accuracy where elementary design principles for the instrument. Additionally, it is easy to decontaminate. 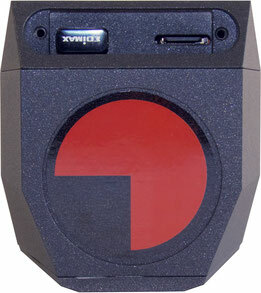 The instrument has different functional modes for the user. 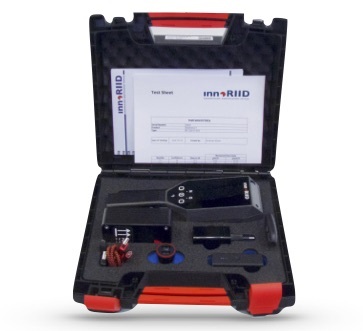 These include: a) a Dose Rate Mode to measure the dose and count rate, b) a Detect Mode, that helps to find and locate sources, c) an Easy-ID Mode to quickly identify the source of radiation. 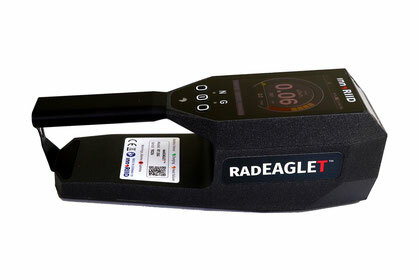 Furthermore, RADEAGLET features several advanced measurement functions, including the same comprehensive spectroscopic laboratory as RADEAGLE, e.g. with a detailed spectrum analysis screen, sensitivity adjustments for its sensors or an automatic ID with waterfall visualisation. 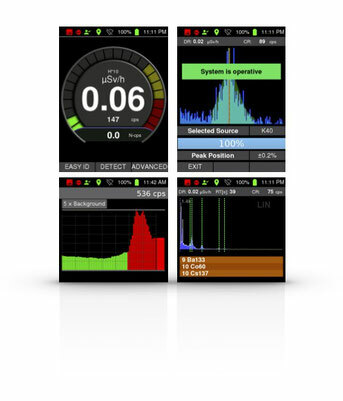 The picture on the left shows the the dose rate screen (upper left), the easy-calibration screen (upper right), the detect mode (lower left) and the spectrum view with ID based peak indication (lower right). There is a WiFi dongle positioned behind RADEAGLET´s front cover. As long as you need wireless connectivity it is safely stored. If you enter areas of high security, e.g. military perimeters or other sensitive infrastructure, often it is not allowed to actually have wireless hardware on board. Therefore, you can simply detach the dongle from the handle and the hardware is de-facto physically removed. The USB port can be used for several things. You can attach a USB stick for copying your data. 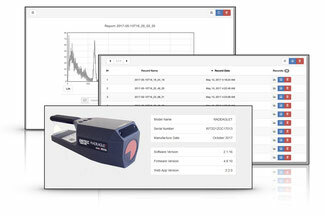 The RADEAGLET software has features for smart extraction of your data. It keeps you updated on the consumed memory and offers different ways of clearing the data, e.g. removing all spectra older than a month. Second, you can connect to any wired network with the USB port. Just plugin a USB-Ethernet cable and you are good to go. You can also get collected data via the SD card. It can be removed and used in any common, available PC. 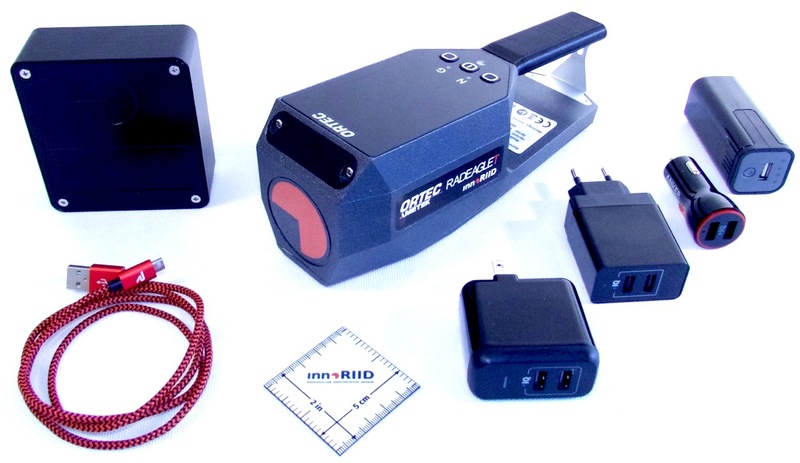 Spectroscopic and radiologic data measured with RADEAGLET is tagged with geographical information, once the optional GPS module is installed. Access to RADEAGLET data is very easy. 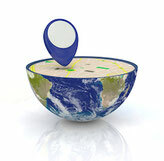 After choosing your preferred way connection (WLAN, WLAN Hotspot, USB, ...), you can simply use your browser to access the web interface of the instrument. You can view and download spectra, generate reports, make comments, review ID results and many other things. The identification of nuclides is based on the spectrum. 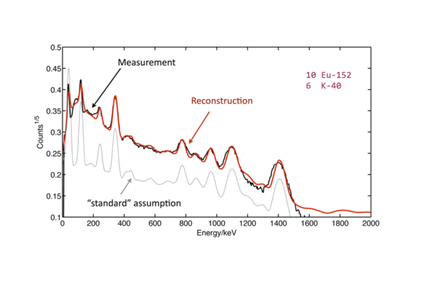 On the computer system of RADEAGLE & RADEAGLET runs a powerful mathematical algorithm that identifies radioactive sources based on this spectrum. It can also find the right composition, if multiple of these sources are there simultaneously. The instrument ships with a rich set of accessories: a USB charger with international plug adapter set together with a high-quality USB cable, a car adapter for charging RADEAGLET from your car connector, a calibration box and a USB extension battery. RADEAGLET does not use any internal source. It does not contain any radiating material at all! Instead, we use the natural background radiation. See the tiny little peak in the spectrum? This is a peak of 40K. It is nearly always there. This is one of many peaks RADEAGLET grabs to keep the calibration in place. And because our detector is so large, it sees the tiny peak very quickly. If you require a unit with internal source, we can optionally equip the RADEAGLET with a small 137Cs source. Calibration Source Natural background. No internal source required.